Measure is an aerial intelligence company that provides world-class drone services and software to companies across the U.S and the Americas. Measure manages a team of up to 30 pilots, including in-house and outsourced resources, to perform a wide range of operations such as inspections of solar and wind farms, utility lines, power generation equipment, buildings, and construction sites, just to name a few. They were using four different programs plus some manual processes to schedule flights, assign pilots, enforce safety regulations, track equipment, store data, and report on their activity. Yet, despite efforts, they could not find a tool on the market that provided an effective end-to-end solution for drone operations at scale. So, Measure put together an expert Digital Products team and, in collaboration with Flight Ops, they created the tool themselves. Let's see how they did it. The first thing Measure did was take an inventory of the issues they were having with their existing systems. This provided a high-level roadmap for what they would call Ground Control™. Having flown 10,000 commercial flights, Measure had the direct experience to create the platform they were looking for. In early 2018, they launched Ground Control 1.0, a web portal and integrated flight app, and then spent the next 11 months flying, testing, and enhancing the product to where it is today: Ground Control 2.0. 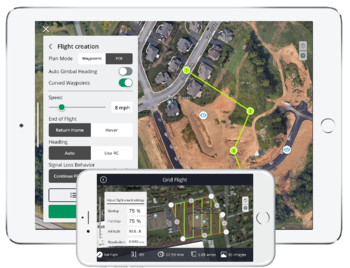 Measure Ground Control was created to be an end-to-end software product for organizations in industries such as wind, solar, utilities, construction, and public safety that are running internal drone programs. 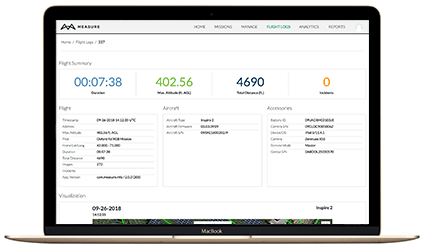 Ground Control 2.0 combines the flight application with a comprehensive program management portal, allowing drone program operators to manage and scale their operations through one system. The flight app was designed for commercial use, without distracting consumer features, and integrates necessary functions like weather and airspace checks and LAANC authorization. The program management portal was created to replace scheduling tools, flight log trackers, and equipment tracking processes. The portal was designed to integrate well with ERP systems and GIS tools, and the team added features to make flight planning and data management more efficient. For full feature list and more product images, download the PDF. Measure Ground Control provides immediate financial return in the form of technology cost savings, as it can replace up to four different different 3rd party software systems. 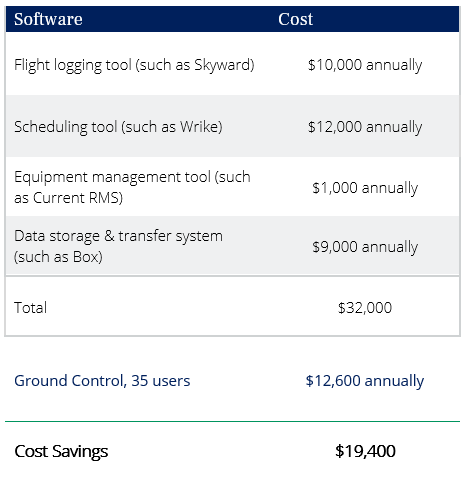 For Measure, Ground Control provides $19,400 in annual software cost savings. Ground Control also provides significant efficiency gains by improving workflows and reducing data collection errors. Measure saves two hours per mission and has further reduced the frequency of repeated flights. Measure has experienced improved safety outcomes when using Ground Control. Automated flight incident tracking has improved safety oversight, promotes pilot adherence to policy, and acts as a warning system for possible malfunctioning equipment. 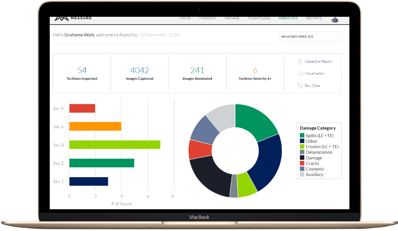 Automatically uploaded flight data means 100% tracking, and easily exported reports makes meeting reporting and compliance requirements easier and quicker. Reports can be generated on demand and include detailed flight information. Ground Control’s in-app checklists have ensured Measure pilots always have access to proper safety documentation and protocols in the field, catching errors that otherwise may have been overlooked due to lack of information. "Operating in today's aviation environment can be incredibly complex," states Measure's VP of Flight Operations, Brendon Conroy. "Measure Ground Control has simplified my program management needs into one cohesive platform. By streamlining planning and management, we are reducing errors in the field and operating more efficiently, effectively, and safely." Measure Ground Control is helping enterprise companies like AES scale their drone programs. AES is a Fortune 500 energy company with more than 150 drone pilots as part of their global drone program. Measure has been there to help AES set up the program from the ground up, utilizing Measure’s services for training, inspections, and advisory. As the program began to scale, more services shifted in-house and a greater need was on program management. Subsequently, Ground Control was introduced to the entire organization. In the program’s first full year, it realized more than $4.6M in financial benefit to the company.